Can you please help with two pieces of inherited jewelry with hallmarks that i cannot identify? I have recently inherited some jewelry of my late grandmothers. Most of them I have been able to identify and date but these two items are a little harder for the novice. the first item is a delicate rope chain, I can establish that it is 9ct gold and imported but can find no reference to the date or the 'jj' in the shield. 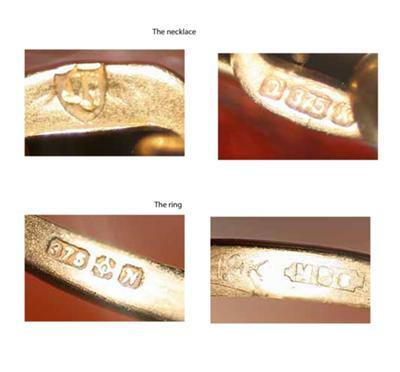 The second item is a ring with two sets of hallmarks, one very clear, the other worn. Again it is 9ct but I can find no reference to the origin of the hallmark, thus not allowing me to put a date on the ring.